Gavin Schmidt and Stefan Rahmstorf discuss the difference between the weather and the climate and the relevance of noise. There are many correct things in their text but there is a lot of naivité in it, too. They present the observed temperatures as the sum of an underlying trend - something that they count as the climate and that should probably be dominated by greenhouse gases - and a random noise that is called the weather. The weather controls the short-term behavior but it averages out if you consider a long enough period of time: they mention 15 years as the period where you start to see the "climate". The actual "long-term" climate is not composed of one effect, as they seem to incorrectly assume, but hundreds of effects that operate at all conceivable time scales from seconds to billions of years. The long-term effects do not contribute a linear function to the temperature and other quantities. Instead, many long-term effects are oscillating or even periodic. There is no sharp boundary between the short term and the long term. A choice of such a boundary is a pure convention and one must always be aware that there exist "faster" as well as "slower" effects that influence reality. For every animal, man, or nation, it is actually the local weather that is more relevant. The local temperature is much more wildly oscillating with time than the global average which really means that the weather is always more important for every animal, man, or nation than the long-term averages. The long-term behavior is only interested for a very specialized group of experts - or for chronic bureaucrats - but not for reasonable policymakers or ordinary people. The averaging both over space and time can increase the "signal to noise ratio" but such an averaging is never perfect. Observed changes over long periods of time that may be comparable to one century can still exhibit trend-like patterns that are nevertheless a result of noise. Even areas that are smaller than the surface of Earth and time periods that are shorter than a century may be large enough for the hypothetical noise to average out. It means that a disagreement of reality with a long-term large-area model prediction for whole continents or 30-year-long intervals may still be able to falsify the model or at least provide us with strong circumstantial evidence that it is incorrect. When they talk about noise, they clearly imagine some kind of non-autocorrelated noise in which the temperature anomaly for one day is uncorrelated to the anomaly from the previous day (or year compared to the previous year). In reality, the "noise" always has some autocorrelation, regardless of the time frame we use for averaging, and it is important to know the color of the noise. They assume that the "trends" and "noise" must simply be added. However, this linearity doesn't hold too accurately in Nature, especially because the character of the noise - the weather - may also be changing with the "trends". This fact makes it harder to properly separate these two. Let me now discuss these points one by one. Their picture of reality is truly simple: the temperature is the sum of an underlying, nearly linear warming trend caused by CO2 and a noise called the weather. They are not interested in the weather and they think that they don't have to understand it: we will return to this assumption later. But once they average the weather out, they parameterize the result as a trend. But that's not what the result looks like in Nature. Even if you subtract all short-term phenomena whose duration is shorter than 15 years, you don't end up with anything like a linear function. Both observations as well as a good theoretical perspective shows that there are many other things, too. The solar activity oscillates in the 11-year cycles that are modulated by 200-year cycles. The circulation of oceans periodically brings warmer and cooler water to different places and it is a mixture of waves and chaotic evolution with durations between years and thousands of years. Add all the Milankovitch cycles, continental drift, bubbling of the Solar System through the spiral arms of the Milky Way that is known to modulate the weather through the cosmic rays, and epochs in the life of the Sun. All these things matter. The temperature in reality is a mixture of periodic as well as aperiodic, oscillating as well as monotonic, easily calculable as well as unpredictable curves with all kinds of frequencies you can think of. Even if you decided that the concentration of CO2 is the main thing you want to follow, its profile thousands of years ago was significantly influenced by outgassing from the oceans (that drove it from 180 ppm to 280 ppm and back) and in the future, the concentration of CO2 will depend on future technological breakthroughs or, less optimistically, the desires and successes of power-thirsty megalomanic loons who would like to control the life on Earth. Linear functions are not good enough. 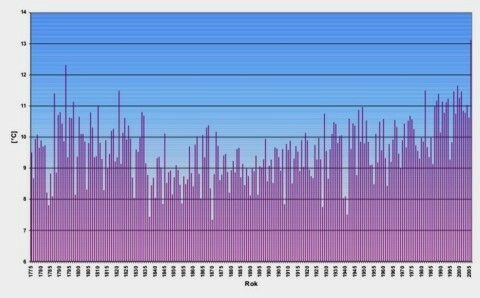 The Gentlemen at RealClimate.ORG try to implicitly convince the readers that 15 years is the time scale where averages of the weather become the climate. But it is very clear that this boundary is nothing else than a convention. If you disagree, try to offer a calculation of the figure 15 years. You won't find any. Moreover, their convention is not the standard one. Atmospheric scientists would usually define the climate from 30 years, not 15 years. Such a sharp or approximately sharp separation would be useful if there existed a dominant time scale above which certain difficult "fast" phenomena would cease to exist. But no boundary of this kind around 15 years exists in Nature. For example, it is not true that the temperatures during one year are uncorrelated to the temperatures of the previous year. Let me explain why. The weather is not just something that changes from one week to the next. The weather is also dictated by El Nino and La Nina patterns and weather scientists must be interested in these things. The typical average duration of an El Nino regime is something over 2 years. It is therefore more likely that the ENSO contribution to the temperature during a year will coincide with the previous year than the probability that they go in the opposite direction. If you disagreed with this conclusion because you imagine a different frequency of ENSO regimes, you won't disagree with the same conclusion in the case of the Pacific Decadal Oscillation (PDO) that also influences the weather but that takes a decade or much more (50 years) to switch to the opposite regime. Will your definition of the weather try to average over the regimes of PDO? If it will, it won't be terribly useful for predictions of anything during a typical human life span because the weather at the 50-year scale will still be affected by these oscillating things. If you won't try to average over the influences of PDO, your understanding of the weather will have an intrinsic error because you will be forced to neglect it: PDO is a part of the weather that is slower than the weather should be. The end of the 18th century was pretty warm, the 19th century was cooler. But the 20th century was again warmer. The graph shows the average annual temperatures but frankly speaking, real people are living real lives and they are affected by daily temperatures. The temperature jumps and drops by 5 °C or so during the day (day vs night) and an additional cycle comparable to 10 or 20 °C is added during the year (seasons). Even the global mean temperature is warmer in July than January by about 4 °C because the land's fluctuations exceed those of the oceans and most land is on the Northern Hemisphere which is why the (rich) Northern Hemisphere dictates the sign to the world. A seemingly subtle geometric asymmetry between the South and the North can generate a huge global difference between the seasons. If you think about it and look at the graphs, the change of some carefully smoothed out 10-year average by 0.3 °C per 50 years - most of the life of a human being - is completely irrelevant for the life or people in Prague in comparison with the fluctuations described a minute ago. Moreover, the underlying 0.3 °C warming is only calculable globally. Prague is smaller than Earth and the slope of the trend will be affected by much wider error margin. I was talking about people in Prague but I hope that the readers understand that the same conclusion holds for people in any town or village in the world: it holds for all people. Some laymen (and even poor-quality scientists) think that if they create a graph of x vs. y and the correlation is nonzero - if there is some increasing or decreasing underlying trend in it - it means that they have discovered an important signal from God or Nature that must be taught and used by the society. Some scientists, especially those who promote the climate alarm, like to abuse this irrational feeling of the laymen. In reality, the correlation coefficient never ends up being exactly zero. Even if the data were random and uncorrelated, it would not be exactly zero for a finite number of points. But besides "clean" random noise, or "cosmic variance" if you wish, there can also be a lot of hard-to-predict low-frequency contributions in the datasets such as the Pacific Decadal Oscillation discussed previously. You are almost guaranteed to see some trends, either increasing or decreasing, in any temperature graph you look at. It is unlikely for someone to obtain exactly zero for the slope of linear regression. Having any nonzero slope can never be a rational reason for alarm. And obtaining the warming sign of a trend more frequently than the cooling sign - or the other way around - is not a reason either. It is the normal state of affairs. The champions of climate hysteria often like to dismiss any disagreement of their model with somewhat detailed observations as nothing else than noise. For example, Antarctica has been gaining mass recently. Some alarmists will tell you that it was just a fluctuation. Others will tell you that this change is actually confirmed by their best models. These answers completely contradict each other but the advocates of these two viewpoints never argue with each other even though they like to consider their answers to be important and the question to be settled. Why don't they argue with each other? Because they don't really care about answering scientific questions. They care about silencing climate realists and about the promotion of their favorite policies of regulation. From this "key" point of view, both contradictory answers are equivalent. In reality, Antarctica is a large enough region and 30 years is long enough period of time for models that are sometimes used to determine our policy for the year 2068 to predict nontrivial things about the weather trends in Antarctica since the late 1970s. If the models can't do it, it's too bad because the verification of any model or theory must always be based on an extensive enough set of numbers - i.e. on high-frequency and/or local observations. If you have a model that fails to predict a hemisphere (or 30-year trends), it is very hard to convince a rational person that once you jump from the hemisphere to the whole Earth (or from 30 years to 60 years), all the errors of the model inevitably evaporate. The relative error margins may drop by the square root of two in both cases but this change can't really change the "everything is noise and nothing needs to agree" situation to the "everything is perfectly accurate and trustworthy" situation. The smaller regions we consider, the more legitimate it is to say that what we see is just noise. For example, the record low sea ice area in the Arctic in 2007 was arguably an example of weather. On the other hand, we don't have to talk about the Arctic or Antarctica. Instead, look at the hemispheres. In the last 30 years when the temperature was measured with satellites, the trend on the Southern Hemisphere was about 3 times slower than the trend on the Northern Hemisphere. That means that even if you take regions that are almost as large as the Earth - namely one half of it - and time intervals that are as long as 30 years, the "noise" is at least as large as the "signal", assuming that there should be any "signal" (global warming) at all. And this huge noise survives despite the long time interval and despite the average over the whole hemisphere. The noise in Prague or any other place is actually much much larger than the noise associated with a hemisphere. The warming trend is clearly negligible. Switching from the hemispheres to the whole Earth or from 30 years to 60 years only changes the matters a little bit, by the factor of the square root of two. Moreover, it is really the hemispheres and individual years that matter for living creatures and nations. Schmidt and Rahmstorf as well as many others often think about the weather as about noise with no autocorrelation. The temperature anomaly on Sunday has the same chance to be positive and negative regardless of the temperature anomaly on Saturday. The temperature anomaly in 2008 is uncorrelated to the temperature anomaly in 2007. But as we have explained, it is certainly not true. The temperature difference between two moments separated by a short time interval is likely to be small because the temperature is a continuous function of time, after all, and its characteristic size scales up as a power of the time interval. The critical exponents are very interesting to study and good climate models should also be able to reproduce the critical exponents observed in reality: the existing climate models usually don't do it correctly. You should imagine the temperature graphs to be somewhat similar to the Brownian motion: the shorter intervals you look at, the greater warming trends per decade you extract from them. The same thing holds for "random trajectories" in Feynman's approach to quantum mechanics: the random trajectories are equivalent to Brownian motion, after all. The longer intervals you study, the more accurate cancellations take place and the smaller trend you are left with. In reality, the actual power law has a different exponent than the exponent found in the Brownian motion. But just like in the Brownian motion, the climate is able to accumulate a significant deviation from the "classical expectation value" over time even though it is not really infinite as the Brownian example would lead us to believe. Finally, the RealClimate.ORG ideologues like to present the underlying climate trend and the noisy weather as two uncorrelated terms: the observations are simply the sum of these two. This linear expectation is the first one we consider but there exist good reasons to think that this approximation is simply not good enough. For example, the observed warming at nights and winters seems to be faster than the observed warming during days and summers: the differences between day and night and the differences between summers and winters shrink. And if you care, flowering orchids don't really care about the night temperatures, so they are not too affected by global warming. ;-) It is clearly an example of a non-linearity. Incidentally, this observation is also a reason not to take the greenhouse explanation too seriously because the greenhouse explanation effect should work uniformly 24 hours a day and 365.25 days a year. While the linearity is a good starting point, one must be very careful about similar assumptions. As a minimum, a scientist should realize that he is making an assumption and that every assumption of this kind can be wrong. He should try to check and clarify many other details. He should never be satisfied with superficial and naive models of reality such as those presented by Gavin Schmidt and Stefan Rahmstorf. Weather is seasonal, 4 months long, just an inconvenience. Climate is survival, 4 years long, before you move along. In between needs to be named by the data manipulators. So you need a sharp notch filter for the yet un-named.